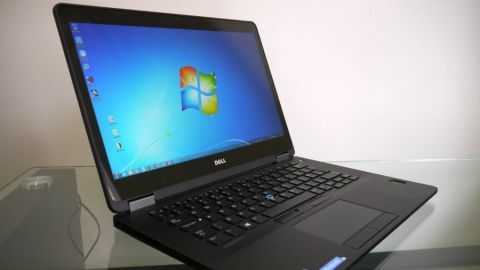 Dell has produced a great business laptop which covers every important angle from performance through to repairability. The release cycle of the Dell Latitude E7470 follows that of Intel's new architecture very closely so it was not a surprise to hear about new models earlier this year. What was surprising was that the announcement happened at CES, not your usual business event. Bringing the concept of Ultrabooks to the entreprise and discerning business users can be a balancing act as there are more important concerns than just sheer aesthetics or price. Ease of maintenance, aftersales services, connectivity and compatibility with existing infrastructure are sometimes just as important – if not more important. With that in mind, while the E7470 is certainly not the best-looking laptop on the market – it's definitely not an XPS 13 or a Lenovo ThinkPad X1 Carbon in terms of design – this notebook is deceptively functional. The model that we received is the top of the range one, retailing for a jaw dropping £1,508 (around $2,130, or AU$2,830) excluding VAT and shipping (although removing a few options like extra warranty can bring the price to about £1,400 – around $1,970, or AU$2,620). However, given Dell's propensity to rely on the channel, shopping around means that you can find an E7470 for as little as £883 (around $1,240, or AU$1,660) – at Ballicom – albeit with a different set of components. The shell though remains the same across the range: smooth and rubbery, thanks to a woven carbon fibre finish, and reassuringly solid and sturdy with a magnesium alloy chassis. Dell engineers managed to tweak a timeless design that has worked across several generations of Latitude laptops already. Maintenance is key to any business laptop and this one is no different. Just take off a few screws and you can remove the entire bottom cover to easily access the serviceable parts. Given that the laptop underwent extensive military-grade MIL-STD 810G testing, it's no surprise that it doesn't flex or twist – and that goes for the base unit and the keyboard plus screen (at least under normal usage). Having a large base means that the display – which is secured via two hinges – is stable when typing. Our model had a touchscreen display with a thin rubber frame; it uses Corning's Gorilla Glass NBT which makes it even more rigid. At 335 x 232 x 19.4mm with a weight of 1.5kg, it falls well within Ultrabook dimensions and can be easily picked up and carried with one hand securely. Being relatively thick means that the E7470 has far more ports and connectivity options than your average Ultrabook. There's a docking station connector underneath, then at the back, a Gigabit Ethernet port, HDMI, DisplayPort, two USB 3.0 ports and the power socket. A SmartCard reader, an SD card reader, a third USB 3.0 port and a SIM slot can be found on the sides of the laptop. Should you want extra ports or legacy ports, check out the Advanced E-Port II Replicator/docking station (which Dell sells for £192 – that's about $270, or AU$360) which adds two DVI-D ports, a VGA one as well as an eSATA, two PS2, a serial and a parallel connector. All that's great for older peripherals. Note that the Latitude E7470 is compatible with docking stations for previous Latitude (E5xxx and E6xxx series) models although you will probably need to upgrade to the latest BIOS and update the appropriate drivers. Wireless connectivity is handled by the Qualcomm Snapdragon X7 LTE/4G modem (DW5811E) and an Intel Wireless-AC 8260 card that also handles Bluetooth. Security and management are also very high on the agenda. The E7470 comes with TPM 1.2 (which will be upgraded to TPM 2.0 later this year), a touch fingerprint reader, an NFC reader, Dell Control Vault 2 and a lot more. Dell Data Protection, the company's own Encryption Security software, is available from £18.55 (Personal Edition license with ProSupport for Software for three years). As for management, E7470 users will rely on the optional Intel's vPro management features as well as Dell Client Command Suite for BIOS and system configuration. At the time of writing, 10 standard base units were available on Dell's website – you won't be able to change much of the configuration, only tinker with them. Should you want to have a customised quote, you will need to go through the online chat and talk directly to a customer assistant. Only two processors are available, both from Intel's sixth generation family: the Core i5-6300U and the Core i7-6600U. Both are dual-core models supporting up to 32GB of DDR4 memory, are vPro compliant and offer Trusted Extension Technology, SGX and MPX extensions and Transactional Synchronization Extensions New Instructions (TSX-NI). The integrated Intel HD Graphics 520 supports 4K, DirectX 12 and OpenGL 4.4. The three differences between the CPUs are the cache (4MB vs 3MB), the base/configurable TDP-up/turbo frequencies (2.6/2.8/3.4GHz vs 2.4/2.5/3GHz) and a slightly higher maximum frequency for the integrated processor graphics (1.05GHz vs 1GHz). Either 4GB or 8GB memory configurations are available on the website which may force you to get rid of existing memory modules. The E7470 has two memory slots each capable of housing 16GB for a maximum of 32GB of system memory. Screen-wise, you have the choice between an HD model (1366 x 768), a full HD one and a QHD (2560 x 1440) offering with edge-to-edge touch display utilising Corning's Gorilla Glass NBT. The display was bright as expected with excellent contrast ratio, viewing angles and colour renditions. As our sample had touchscreen capabilities, it meant that there was plenty of reflection especially in broad daylight, but it handled fingerprints better than some of its rivals. Note that the screen can lie completely flat which might come in handy if you plan to use it with some legacy overhead projectors. One nifty accessory available is a 6-cell 18Ah battery called the Dell Power Companion that can charge the laptop's 4-cell 55Whr battery – as well as two other devices simultaneously – when you're out and about. Integrating this technology with the humble power adaptor might be the next big thing to hit your laptop. There's a 256GB M2 2280 SATA3 SSD from Samsung to provide system storage, but no optical drive, a move that makes sense given the need to strike the right balance between features and portability. As for the input peripherals, the keyboard – featuring keys that are slightly curved to fit your fingertips – is springy without being mushy, providing a good travel experience, although we found that we needed to apply a bit more pressure to register a keystroke (that's coming from an XPS 13 user). Note that the keyboard itself doesn't flinch even under a mildly aggressive typing session and the fact that it is backlit (and spill-proof) is a bonus. The touchpad delivers a consistent smooth gliding experience with dedicated mouse buttons. There's also a TrackPoint with three dedicated buttons, not something we are fans of but some business users, especially those who have espoused the concept since the days of IBM's ThinkPad, swear by it. Dell provides a three-year warranty, ProSupport and next business day on-site service (NBDOSS) by default and this can be downgraded to just NBDOSS to save about £100 (around $140, or AU$190). Alternatively, you can upgrade to a five-year service for about £200 (around $280, or AU$380) more. By default, you get Windows 7 Pro with the ubiquitous free upgrade to Windows 10 Pro but surprisingly, no Windows 8.1 option. There's not much to dislike about the Latitude E7470 – and do note that some of the limitations of Dell's ordering system can be mitigated by asking for a customised quote. During our brief time with the laptop, we found it to be fast, silent – even under load (although we didn't try prime95 or any similar benchmarks) – and it boasts some top-notch input peripherals and an equally great reparability experience. In terms of autonomy, everything about this machine is certainly solid enough, although an easy-to-remove battery would be the only improvement we'd suggest. Otherwise, this is the closest to the perfect business laptop that we've seen from Dell.